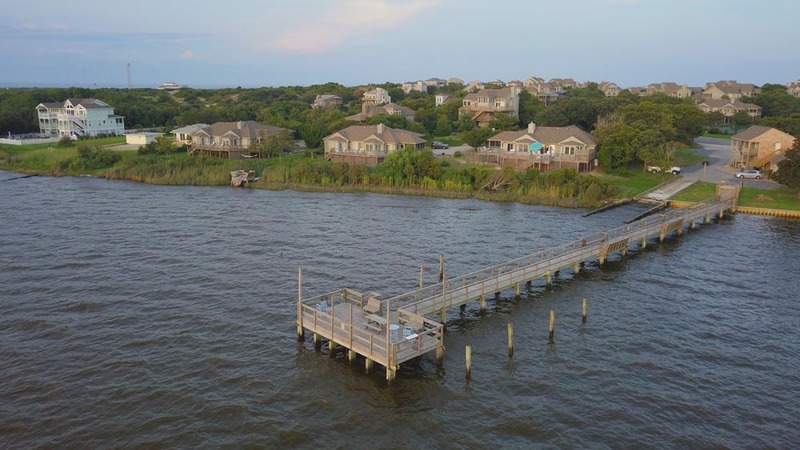 Ships Watch has two unsurpassed amenities: over 500 feet of wild beach on the Atlantic with easy access from any house, and eye-popping views of the Atlantic Ocean and Currituck Sound that emphasize how far out in the ocean you really are. No house is more than easy walking distance to either the sea or the sound. The beach depth varies with the tide, but even at high tide, offers a broad slightly-sloping sandy incline that a youngster can cross to play in tide pools and ocean foam. Then there are the winds –– that originally brought the Wright Brothers. Steady and reliably tropical from the south in spring, summer and fall; gutsy and gusty from the north in winter , which contributed to making the Outer Banks the “Graveyard of the Atlantic” because of the many ships which have floundered or sunk off-shore in the area. 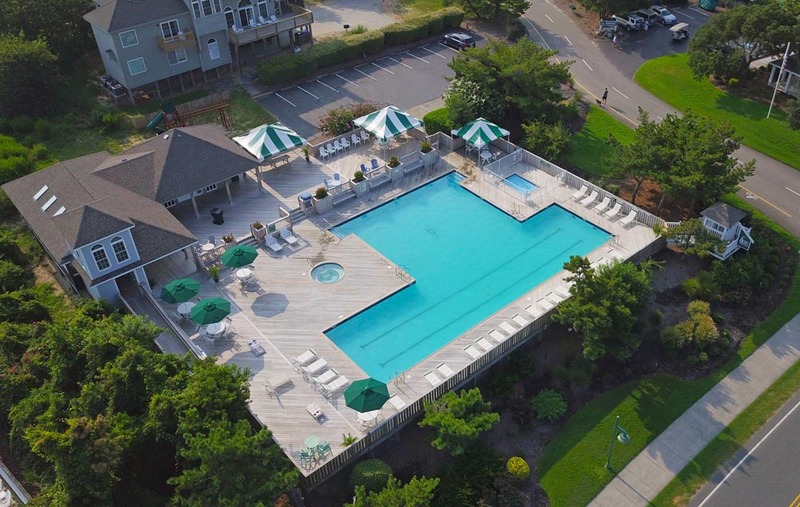 We have the standard amenities, of course, a 3-lane, 25 yard pool for lap swimmers attached to a larger pool for bathing and play. A design element we used was to raise pool and decks above ground for sweeping views of the sound and tropical breezes. 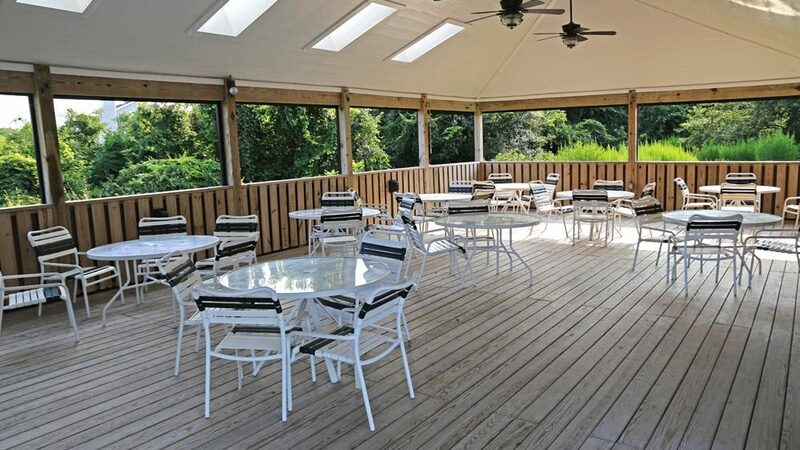 A pavilion serves as our activity center with Kevlar screens that can cut a gale to barely a breeze, the better to hear and see from the wide-screen TV for those can’t miss sports broadcasts and Monday night movies, complete with fresh popcorn. The pavilion also serves as the site for our weekly Saturday “Welcome Back” picnic to give you the chance to catch up with friends and make new ones. In summer, the pavilion is ground zero for our kids (of all ages) activities, especially the tie-dying tee shirt and kite-making competitions. Our tennis center has also become the “Pickleball” center for the Outer Banks, complete with our mascot, “Mr. Pickle”. 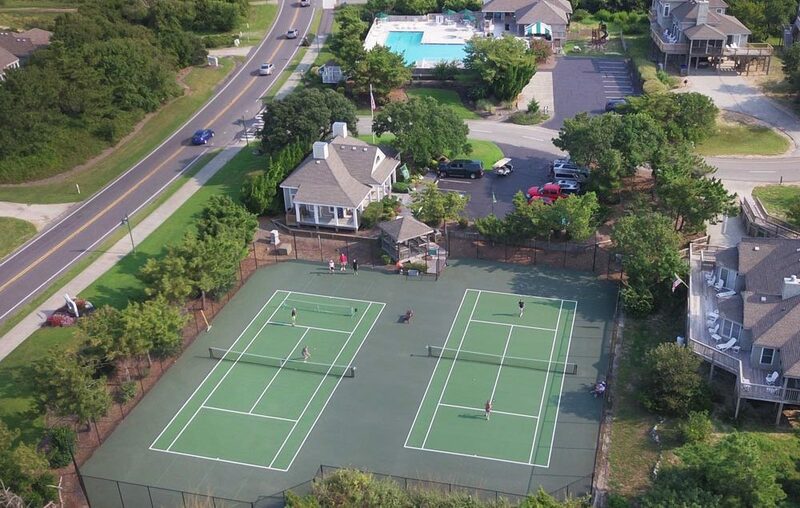 We have two well-appointed and maintained tennis courts and two pickleball courts for lots of good exercise and social fun. 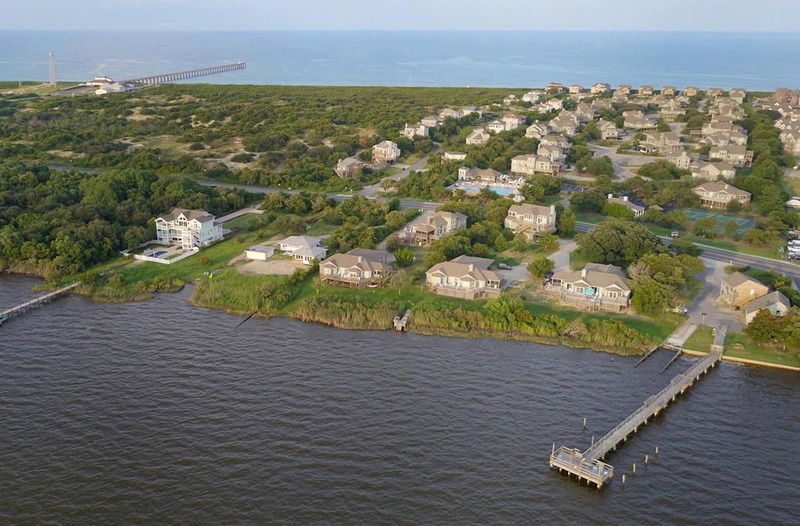 On the sound, we have a 100 yard pier jutting into Currituck Sound. The catch of the day could be stripped bass or flounder for those of a mind to “wet a line” and the sunsets on the pier are each like original paintings, with a new variation of clouds and colors every day. There is also “crabbing”, by either pot or line, for the famous Blue Crab. Easy to catch, easy to cook and so devilishly hard to pick out meat sweeter than a lobster. Or, walk down our boat ramp to the grassy shallows and hand dip soft-shell crabs on a full moon. Kayaks, canoes and small sail boats can be reserved for the more adventuress, or bring your own and we’ll have it ready when you are. Water, water, truly is everywhere. We also rent golf carts for use in Ships Watch only. Talk about something the little people love! But, driving is limited to adults with a valid driving license. For quieter times, there are multiple decks or balconies on each house, where you can join in conversation and play or find that quiet place alone to read or bask in the sun. A quarter mile down the pedestrian walkway is famous Duck, the lost New England Village that washed up on the Outer Banks beach. A boardwalk stretches for two miles, with Currituck Sound on one side and many small shops, stores, galleries and restaurants on the other side. There are also side piers that wander through the marshes, ponds and nature areas, full of wading birds, geese and, of course, all varieties of ducks. Among the many attractions and things to see or do, we should also mention the area’s famous lighthouses, the site of the historic “Lost Colony” (with re-enactments in summer), hang-gliding school on Jockey’s Ridge, the area’s small wild horses and the deserted wild beaches of Corova and Pea Island. That’s why you must have five weeks a year; less is too little time.